During the 2007-2009 financial crisis several large European commercial banks experienced significant retail deposit withdrawals even after they had received support (e.g. “lender of last resort” assistance in the case of Northern Rock in the United Kingdom). The crucial role of liquidity risk in the crisis has led policy makers to harmonize minimum liquidity requirements for banks within the regulatory framework of Basel III. These recently proposed liquidity requirements are based on the premise that customer funding of banks is more stable if (i) clients are covered by deposit insurance and (ii) they have well-established relationships with the bank. While the idea that well-established client relationships are important for the stability of bank funding seems intuitively appealing, there exists very limited empirical evidence to support this claim. Indeed, there are very few empirical studies which shed light on the socioeconomic factors which influence the withdrawals of customer funds from distressed banks. The majority of existing studies (see e.g. Calomiris and Mason (1997) or Goldberg and Hudgins (2002)) use bank-level financial statement data or bank-level interest rate data to study the impact of bank distress on the flow and pricing of insured vs. non-insured deposits. Unfortunately, these studies provide only a coarse understanding of the withdrawal behaviour by retail depositors as (i) they can rarely distinguish household deposits from those of non-financial firms and (ii) they cannot relate withdrawal behaviour to the number and scope of bank relations that a household maintains with other (non-distressed) banks. More recently, researchers have employed client-level administrative data to provide a detailed account of retail deposit withdrawals from distressed banks. Davenport and McDill (2006) provide evidence suggesting that the impact of (or the lack of) deposit insurance on deposit withdrawals may be largely driven by business accounts as opposed to retail deposit accounts. Iyer et al. (2016) show that well-informed depositors (e.g. depositors that, at the same time, borrow money from the same bank) are more likely to withdraw from a distressed bank while depositors with deposit insurance are less likely to do so. In order to study how depositors react to exogenous shocks to the solvency of large commercial banks, we examine the Swiss retail banking sector. Examining Switzerland is convenient as it provides us with a “natural experiment”: the two largest Swiss banks (UBS and Credit Suisse) incurred substantial losses during the crisis, while their domestic competitors did not. Importantly, the losses were unrelated to the domestic retail market, but instead entirely driven by trading losses and write-downs on international securities. During this time period, these losses wiped out a substantial share of these banks’ pre-crisis equity (e.g. cumulated losses (between 2007-2009) of UBS reached almost 60 percent of its equity in 2006) (see Brown et al. (2016) – Appendix 1). In response, both banks were forced to raise additional shareholder capital (see The Guardian (2008), UBS (2007), UBS (2008a)), while UBS also required a public bailout in October 2008 (see UBS (2008b)). By contrast, none of their domestic competitors had to write down any assets of significant magnitude or were reporting losses. Aggregate bank-level deposit data suggest that these two large distressed banks, UBS and Credit Suisse, were subject to substantial withdrawals by depositors. 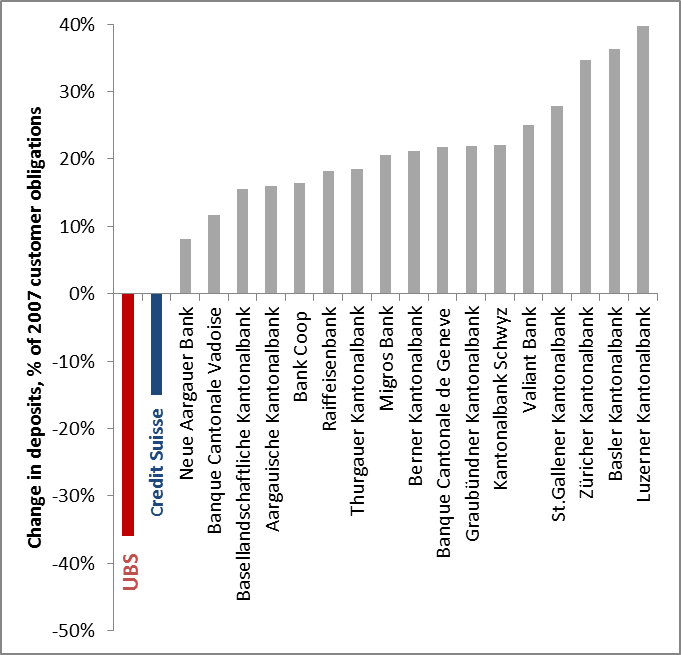 These banks experienced a significant decline in their customer deposits as displayed in Figure 1: between 2007:Q4 and 2009:Q4, total customer deposits at UBS declined by 36 percent. In the same time period, customer deposits at Credit Suisse declined by 15 percent. By contrast, customer deposits at other Swiss banks increased during this time period (see Figure 1). In a working paper underlying this post, we use survey data covering a representative sample of households in Switzerland with information on their banking relationships. We use this sample to study deposit withdrawals from distressed banks in the 2007-2009 crisis. In particular, we examine which customer relationship characteristics affect the propensity of retail clients to reallocate deposits away from the most distressed bank (UBS). To this end we elicited information about all bank relationships which households maintained prior to the 2007-2009 crisis as well as their reallocation of funds between banks during the crisis. We also gathered information on socioeconomic characteristics (e.g. age, education, gender, household income and wealth), financial literacy, behavioural traits (e.g. risk aversion, time preference) and their geographic location (e.g. zip code). Using this survey data, our analysis confirms that – controlling for relevant socioeconomic characteristics – households are much more likely to withdraw funds from the two large distressed banks (UBS and Credit Suisse) than from non-distressed banks. Moreover, we find that the propensity to withdraw funds is much higher in the case of UBS, which was heavily distressed, than in the case of Credit Suisse, which was not as severely distressed: UBS depositors were 22 percentage points more likely to withdraw funds from their account than clients of non-distressed banks. By comparison, Credit Suisse clients were only 4 percentage points more likely to withdraw funds than similar clients of non-distressed banks. Theory suggests that strong bank-customer relationships may mitigate withdrawal risk for at least three reasons: First, consumers may face explicit transaction costs of switching deposit accounts from one bank to another bank. Second, customers may benefit from informational-rents within existing bank relationships, as the bank has superior information about the client than its competitors and is willing to share the informational advantage with its clients. Third, conditional on the supply of banking services, consumers who maintain strong ties with one particular bank may have a preference for the differentiated services of that bank. Our analysis shows that bank-client relationships play a crucial role in mitigating withdrawal risk from the most distressed bank (UBS). We use two measures to capture the effects of relationship scope: First, “Single account” is an indicator for households which have only one deposit relationship. These households would have to incur the transaction costs (fees, opportunity costs of time) of opening a new account in order to reallocate deposits. Second, “Credit linkage” captures whether a household has a loan with a bank and is an indicator of the scope of the bank relationship. One way of gauging the importance of strong bank-client relationships for withdrawal behaviour – e.g. as opposed to deposit insurance – is to compare the characteristics of the 86 households in our sample which withdrew deposits from UBS during the crisis to the 282 households in the sample which have pre-crisis deposits with UBS but do not withdraw them (see Table 1). We find that households which withdrew from UBS are 26 percentage points less likely to be single account holders and are 11 percentage points less likely to maintain a credit relationship with UBS. Households which withdrew do display higher wealth levels, a better knowledge of deposit insurance, higher levels of financial literacy and a stronger interest in financial matters. However, the latter differences seem to be less relevant than our measures for relationship scope as they are not statistically significantly different from zero. The table compares household characteristics of pre-crisis clients of the most distressed bank (UBS) depending on whether they withdrew deposits. The last column tests the differences in means (t-test). The number of households (N) is reported in parentheses. Credit linkage indicates whether the pre-crisis deposit relationship included a credit linkage with the bank (consumer or mortgage loan). Single account indicates whether the household had deposit relationships with only one bank. Low wealth indicates whether the household wealth is below CHF 100,000. Low income indicates whether the monthly household income is below CHF 7,000. High insurance knowledge indicates whether the respondent correctly responds to three questions about the existence & coverage of deposit insurance. High financial literacy indicates whether the respondent correctly responds to the three questions on financial literacy. High financial crisis interest indicates whether the respondent actively informed itself about the financial crisis. University degree indicates whether the respondent holds a university degree. ***, **, * denote statistical significance at the 0.01, 0.05 and 0.10-level respectively (calculated using ordinary standard errors). 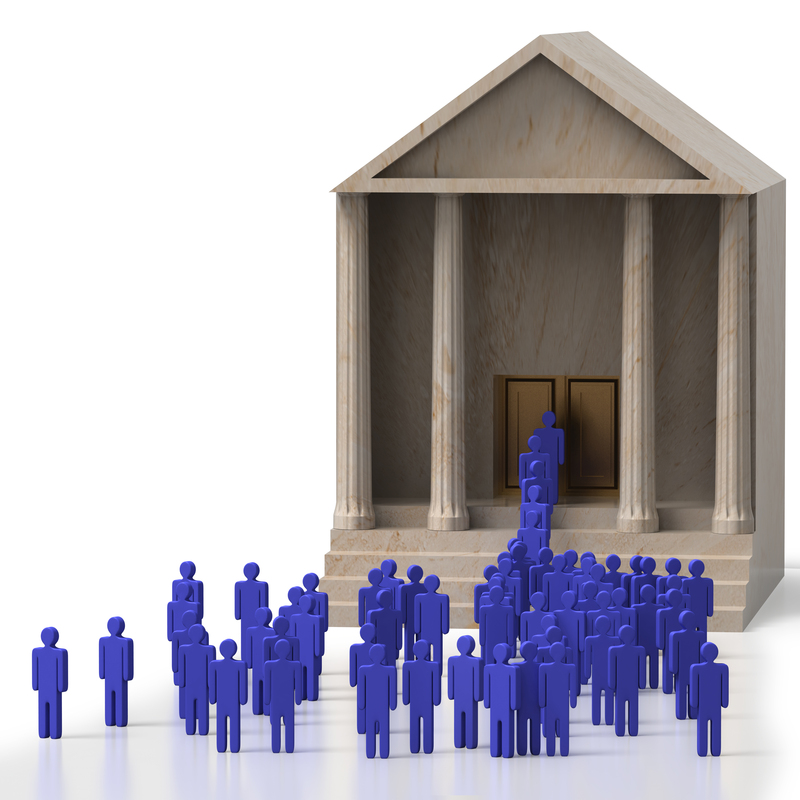 All banks that maintain branches in Switzerland are required by law to participate in the depositor protection scheme. In December 2008 the coverage threshold of the guarantee scheme was increased from CHF 30,000 to CHF 100,000 per depositor and bank. Our survey data does not provide information on the volume of deposits held by households with each of their banks. Instead, we use a variable indicating if total financial wealth is below CHF 100,000 (as a proxy for deposit insurance coverage). In the working paper underlying this post, we show that the withdrawal propensity is slightly higher among households being above this threshold compared to the ones being below this threshold. Our results provide important insights for policy makers concerned with liquidity risk in the banking sector. We document that strong customer relationships are crucial towards mitigating the withdrawal risk of retail deposits from banks. This finding provides an empirical underpinning for the discrimination of “stable” versus “unstable” deposits in the recent Basel III liquidity requirements. Moreover, it emphasizes the relevance of client-bank relationship characteristics for the management and regulation of banks’ liquidity risk. While a strong discrimination of “stable” versus “unstable” deposits might mitigate withdrawal risk, it can make it difficult for depositors to switch funds and, thus, undermine competition. Martin Brown and Stefan Morkoetter are at the University of St.Gallen. Benjamin Guin works as an Economist in the Bank’s Banking Policy Division.